Firefighters have managed to contain and reverse the rapid spread of a wildfire ravishing about 300 acres of land some 35 miles (56 km) east of Los Angeles. Evacuation orders for 300 homes were lifted after the threat was partially averted. The fire quickly encroaching on the residential areas forced the deployment of more than 800 firefighters along with two water-dropping helicopters and two airplanes to battle the blaze. 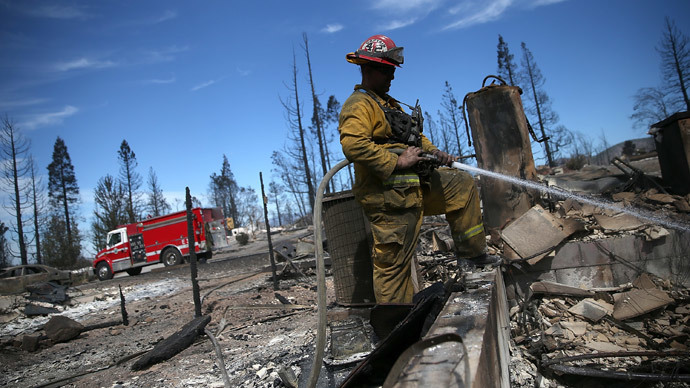 At least nine local fire departments were scrambled which by midday managed to contain 25 percent of the wildfire, which had grown to 1.5 square miles in an area along the border of the cities of Norco and Corona. Cool overnight temperatures and low winds gave the firefighters some leeway in battling the flames. The wildfire, initially reported shortly after 6 pm Saturday, has been dubbed the “highway fire,” as the area that it was spreading into was near the intersection of two major freeways. Capt. Mike Mohler of the California Department of Forestry and Fire Protection said firefighters on the ground were hampered by difficult access to the blaze on Saturday.